I am sure we have all been here. A girl goes missing, you decide to leave the safety of your garage to venture into the world to find her. Your anthropomorphic vulture father figure tries to dissuade you. You have an angry exchange and tear off on your motorcycle into the unknown looking for answers. Whether you have or have not, this is the premise of Buck, a new game hoping to get funding on Kickstarter. 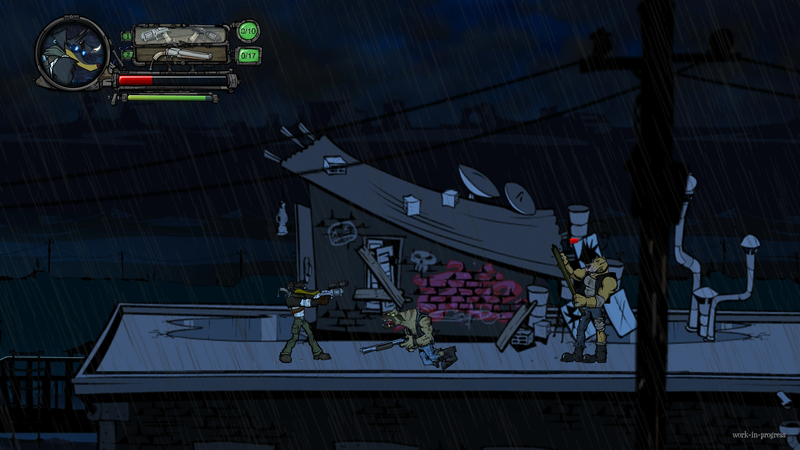 Described as a “2D Post-Apocalyptic Noir Action-Adventure Game”. Buck is the brainchild of Wave Interactive, a three man team who have self-funded the game up until this point. 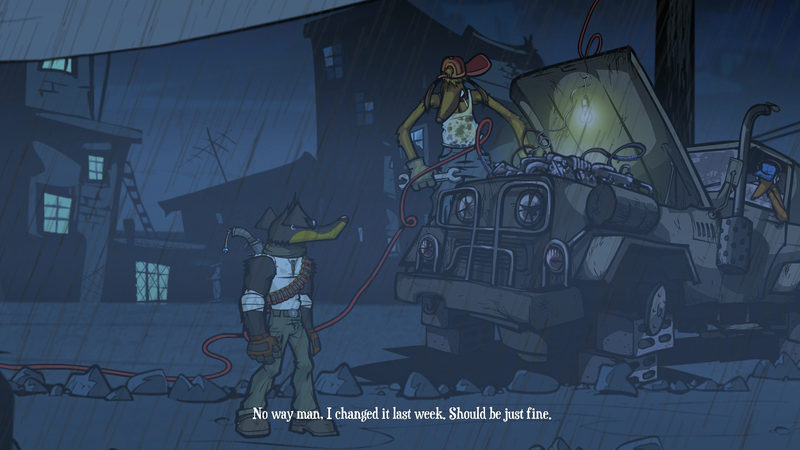 The protagonist Buck is based on the designer’s own pet Buck, who sadly passed away a few years ago. In the video for the Kickstarter, the real Buck is described as “Never letting his size get in the way of his pride”. Which apparently will carry into the theme of the in-game Buck, as a small dog in a big world. Now this is not the first attempt at kickstarting the project, a campaign in 2014 was unsuccessful. The team listened to feedback and have been working on improving the game and the mechanics. They have also included a playable demo build that is available for download on Steam. Even in its early stages Buck shows a lot of promise. The demo has Buck traveling between a few locations. One of them being a town where he undertakes a mission in exchange for getting some information on the girl he is looking for. In the exchange, I was able to choose dialogue options which ranged between honest and earnest to aggressive. The NPC’s responses varied between the approaches but the outcome was inevitably the same. I got the mission and searched through an old abandoned town looking for survivors and supplies. The character artwork and animation are already highly polished. The enemies in the demo are very distinct from each other. From crazed shotgun wielding hyenas who laugh maniacally before letting off a round. All the way up to the hulking berserker character that charges like a canine Juggernaut. It is clear a lot of time and care has been put into really distinguishing these enemies and the tactics you need to use with each. It is a dog eat dog world and Buck is not particularly strong compared to some of the foes he will come across. Also due to the post-apocalyptic setting. Supplies and bullets are scarce, adding survival into the mix. With the demo being a very early build, not all of the gameplay mechanics are in place yet. Buck’s melee attacks are not available in the demo, so it is a bit difficult to gauge what the actual combat will be like at this stage. The shotgun however has a nice oomph to it taking characters off their feet and the dual wielded pistols slow down and whittle enemies. The full game promises customisation of weapons, so hopefully there will be enough options to fit your style of play. It is worth noting that although the demo is very early, it has been updated even along the course of the campaign. The guys at Wave Interactive have added controller support and even tweaked gameplay values based on feedback. It is quite promising given the amount of effort going into this game. If you want to see the game in action for yourself the campaign and demo are available here.